Third and best release from Denmarks Electric Deads. This is one of the best or maybe the best danish 80s HC record ever. Here’s an updated version of Fish In The Pool that appeard on their first record posted some weeks ago. This version is way better. Our old band once toured with a danish band called President Fetch in 1988. Years later I found out that the bass player the one and only Anders Nielsen(Gearbox Agency) used to play in Electric Deads. Why didn’t he tell me? And did he ever record with them since he’s not playing on any of their EPs. ED did the wise decesion to include their lyrics on their second and this 7inch since Bibbi always sounds drunk as hell. Dear anonymus whos post got deleted before. I will not delete comments that are posted by a person who post with a valuable emailadress. If you played in ED and want this taken away then there\’s no problem to do so. This is published for the pure reason to let people get to know a once great band that is hard to come by. Trorod is a nice place :). Wow! I have been looking for info on these guys for ever. I’ve also been hunting for the track “Fish in a Pool” since the ’80s when I lost the MMR 1984 comp I had at the time. That track was a huge influence on me guitar-wise. It was kind of like turbo Husker Du and presaged much of guitar voicing of the post-punk and alt-rock that emerged over the next decade. It was also one of the first tracks I jammed on back in high school with my long time friend, drummer and band mate… Ahhh, the memories! Anyway, blessed is the internet — I’m so happy to see that cool, very hard to find stuff like this can have a second life for the next generation of rockers! 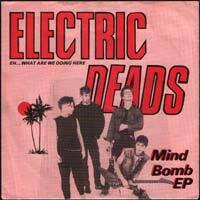 Isnt the duet in ‘Mind bomb’ quite a bit like a Exene Cervenka-John Doe (X) thingy? But then in ‘Fish in a pool’ the singer is more like, er, Damo Suzuki… Ha ha. Nice EP, thanx. go to hear this at Tim Yohannon’s house in SF in 1985 always remembered it great to hear it again! HA HA HA 990 dollars for this? Rob Noxious moved to Denmark? Good luck kobbersnegl. How about 135 dollars. Even when this record was immensly hyped in the 2nd half of the 90s, it never went beyond the 200$ mark. I’d pay 135$ for it, I guess. Would love to have all them ED 7″s back in my collection. I don’t think Anderz was in Electric Deads as he was playing in Enola Gay at that time. However, in 1985 he started Misanthropic Charity with Bibi and Michael from Electric Deads. Misanthropic Charity released one LP and played around until 1989. I saw them a few times and they were great! Thanks for this! I just bought the “Misanthropic Charity” record, can’t wait to hear it. You should note that there’s version of ED’s “Fish in a pool” on the danish compilation called “Complication”. Not so long ago Anderz played at a live show with “Spild af Tid” – it was cool. ADS played too! This band rules! Also the 3 ep’s will be officialy reissued soon!! WOO HOO!! they are all re-issued now. great! Hey all.. it’s my dad on drums in this band Electric deads! my dad is Michael he also play in Misanthropic Charity! :D i think it’s so cool! I may be weird, but I love “I’m a Barbiegirl” and I also love “Fish In A Pool”. Oh, does anybody have the lyrics for “Fish…”?